The opponents of the Invest in Education Initiative have rolled out the same tired talking points used in opposition to progressive income taxation and I’m one of those who is fed up and not taking it anymore. Let’s review the facts of the initiative. This ballot measure would allow voters to close the gap between funding for education coming out of the 2018 legislative session and the funding Arizona schools had from the state in 2008. Since 2008, Republicans have cut $1.1 billion from state aid to school districts. After the gains made due to the RedforEd clash with Ducey and Republican legislators, we were still left with a $690 million shortage compared with 2008. The Invest in Education Act aims to make that up. 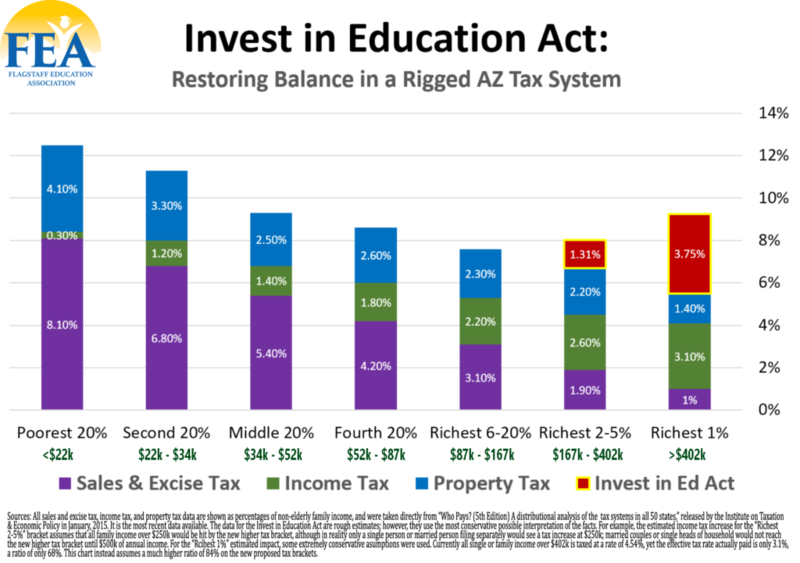 The Act wouldn’t raise taxes on 99 percent of Arizonans. For those folks whose taxable income (that is, after deductions and exemptions) is over $250,000 ($500,000 if they file as married couples) taxes will go up 3.46% on the amounts over $250,000 or $500,000 (if married) and 4.46% on the amounts over $500,000 or $1 million (if married). This is not a “soak the rich” scheme — the rich pay the same rates as everyone else on their income below these amazing numbers. Nor is it “killing the geese laying the golden eggs” because business owners get to take their capital reinvestments off the top before they get to the reportable taxable income and they get to take their charitable contributions as deductions, thereby reducing their taxable income. If anything, a more progressive tax system should encourage investment and charity. The worst is labeling this proposal “class warfare.” Nonsense! What is class warfare is stripping funding from our public schools so that only the rich can get decent educations for their children. Also, constantly raising sales tax rates to the point where the poorest 20 percent pay over 12 percent of their income in combined sales, property, and income tax while the richest 1 percent of us pay only 5.5 percent. That’s not a fair contribution to society and this system needs to stop. Support the Invest in Education Initiative! Posted in Latest News, Letters to the Editor, Talking Points and tagged #RedforEd, Education, Invest in Education.